I never knew that there was an indoor waterpark at the Romulus Athletic Center. The water park includes a lazy river, zero entry splash pool, and a two story waterside. They also have an Outdoor Splash Pool that features an interactive playscape with kiddie slide, a 300 gallon tipping bucket, jets, and more. The outdoor pool also features a concession stand. 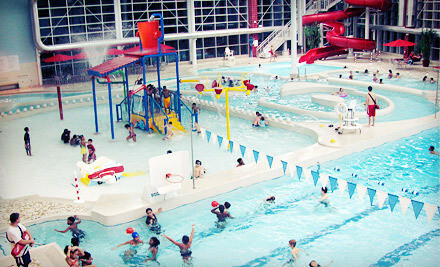 This week Groupon is offering all-day passes to the gym and waterpark. You can purchase two passes for $12 ($24 value) or 4 for $24 ($48 value). Your passes would be good until August 31, 2013. The deal is available for purchase through Sunday, March 31. If you buy your deal now, you could use it next week over spring break. They currently have their hours posted through Friday, March 29. On Weekdays, the water park is open 4-8p Monday and Wednesday, 4-9p Tuesday, Thursday, and Friday, noon-9p on Saturday, and noon-8p on Sunday. Romulus Athletic Club is located at 35765 Northline Rd just west of the Detroit Airport. We have never been to Romulus Athletic Club, but my daughter loves the water and water parks. We recently spent a fun day at Splash Universe, so I know she would enjoy going to Romulus Athletic Club. Disclaimer: I am a Groupon affiliate and am compensated for sales through Groupon links. I appreciate your support of my blog by shopping through my links. Please read all terms and conditions of the deal before purchase, they are only summarized here.